“I don’t even like fruit!” is something that gets said pretty often at home, usually as a grumpy retort to my husband whenever I say I’m hungry and he tells me that there’s plenty of fruit in the kitchen. Fruit? Pleaaaase. Like that’s what I want when I’m actually hungry. My internal monologue still goes there, even though it’s not technically true that I “don’t like” fruit. I just still sometimes find myself reacting to the idea of fruit as if I were kid-me instead of adult-me. Growing up, my main experiences of fruit, in no particular order, were canned “fruit cocktail”, the mush at the bottom of a fruit-based school-cooked dessert, or the miserable looking apple / orange / banana that I found at the bottom of a bagged school lunch on field trips. I wasn’t exactly a fan. Kid-me put fruit of all kinds into the same category: a boring sympathy prize of a food that was best avoided. Teenage-me associated fruit with one thing: diets and deprivation. There are a few occasions in my memories where fruit became something I remember vividly. The way my nana always had a paper bag of deeply hued, finger-staining cherries sitting on a dresser when they were in season. Sprawling in the grass of an overgrown summer lawn, spitting glossy dark seeds from an exorbitantly-priced and exotic wedge of watermelon through the fence into my gran’s neighbor’s garden. (The greengrocer always gave me a wink and a discount whenever she sent me to buy from him, along with an impromptu math quiz, since his register didn’t actually add anything up). Years later at a friend’s BBQ, helping myself to a giant bowl of the most amazing sliced strawberries, swimming in their own jeweled juices because they were macerated with balsamic vinegar. (As soon as I learned this, however, I refused to eat them any more, thanks to my vinegar phobia). When I first left home and had to fend for myself in the kitchen, fruit wasn’t on my purchasing radar, since I viewed it as either a punishment (because, diet food) or an unnecessary extra expense (because that $20 had to last the week and fruit wasn’t filling), depending on which way the pendulum of my moods or financial limitations swung. Fruit was for posh people who had money to burn and didn’t have to worry about being hungry, in my book. I wish I could share some dramatic point where I reversed my stance, but it was so much of a subtle thing that I don’t remember a specific, defining moment of change. Rather, I started to embrace fruit at the same time as I steadily taught myself to cook, to explore fresh produce as a friend rather than foe, to slowly uncouple food from my self worth or self esteem. For so much of my life, food was both punishment and reward, a constantly reversing set of opposites, which meant fruit was either something I paradoxically either “deserved” as diet food (because, worthless) or “didn’t deserve” (because it’s for “better” people). In a strange way, learning to love myself after decades of self deprivation and diets as punishment is directly tied to my enjoyment of a group of foods I used to wholeheartedly reject. So, this summer fruit salad. It’s packed with my favorite seasonal fruits, embracing the first wave of strawberries and cherries and pairing them with watermelon and grapes. It’s a blend of refreshing, sweet and tart flavors and there’s something so glorious about its mix of reds and purples, making it more than easy on the eyes. (And also perfect for the upcoming 4th of July). You could simply chop up all of the fruits and toss them together, but this summer fruit salad has a little something extra that elevates all of its natural sweetness with a simple little trick. My California-born husband has always salted watermelon when he eats it, something that struck me as a little odd at first until I tried it. It seems that I’m a sucker for a salted and sweet version of almost anything and this summer fruit salad is no exception. But it goes a little further than just adding a few good pinches of salt. Browsing through Instagram a while back, I came across a photo of this Watermelon Chaat from NYT Food. Chunks of watermelon are served up with a sprinkle of toasted cumin, sweet paprika, black pepper, amchur powder and salt atop each piece, making each bite an intriguing blend of hot, sour, sweet & salted flavors. Paired with the refreshing summer staple fruit, the idea just got stuck in my head. I went in search of other versions of this spice blend — called chaat masala in South Asian cuisines — and found recipes for other fruit salads that each used their own unique spice blend recipes to bring added vibrancy to seasonal fruit. I learned, too, that these fruit salads — themselves referred to as different fruit chaat — are common in India and Pakistan and that they are a frequent addition to the Ramadan meal iftar. The iftar meal takes place after sunset and is the one that breaks the fast of the day. A fruit chaat is often part of that meal, especially in climates where the hydrating nature of those fruit salads is especially welcomed. Seeing this mixed Seasonal Fruit Chaat recipe on The Kitchn inspired me to put together all the summery red fruits that make up this recipe. I’m hesitant to call the seasoning blend I used in this summer fruit salad a true chaat masala, since it lacks the characteristic toasted seed spices and nightshade spices that I can’t yet tolerate eating myself. But I pulled together a blend that is sour from the amchur, has heat from the ginger, has the fragrant bite of fresh cracked pepper and the aromatics of ground mace, along with a liberal amount of salt. It’s not exactly a classic chaat masala recipe, but since I understand that there are thousands of variations, many of which are passed from family member to family member, I hope you can forgive me with the liberties of interpretation I’ve taken here! A quick note on amchur, the key ingredient here. Amchur is the ground powder of green (unripe) mangoes. I’m mostly familiar with it through its use as a souring ingredient in Indian dishes such as curries and chutneys. Here, it adds the tangy sourness that contrasts so beautifully with the fresh fruit and the more punchy spices. You can find it inexpensively in international or Indian markets. If you don’t have access to those, you can also find it online. You can make up this summer fruit salad just before serving, or ahead of time. It’s at its best when it’s had at least 30 minutes for the salted spice blend to draw out some of the fruit juices and for all the flavors to mingle. You can keep it in the fridge overnight or even a little longer than that, but be aware that the longer the fruit sits in its own juices, the softer (and more deeply hued) the strawberries will become. I especially like it the next day for breakfast, atop some coconut yogurt, served with a drizzle of raw honey, a sprinkle of dried mint and another pinch or so of salt and pepper to really make it punchy, just as you see above. Inspired by this Watermelon Chaat from NYT Food and this Seasonal Fruit Chaat from The Kitchn. 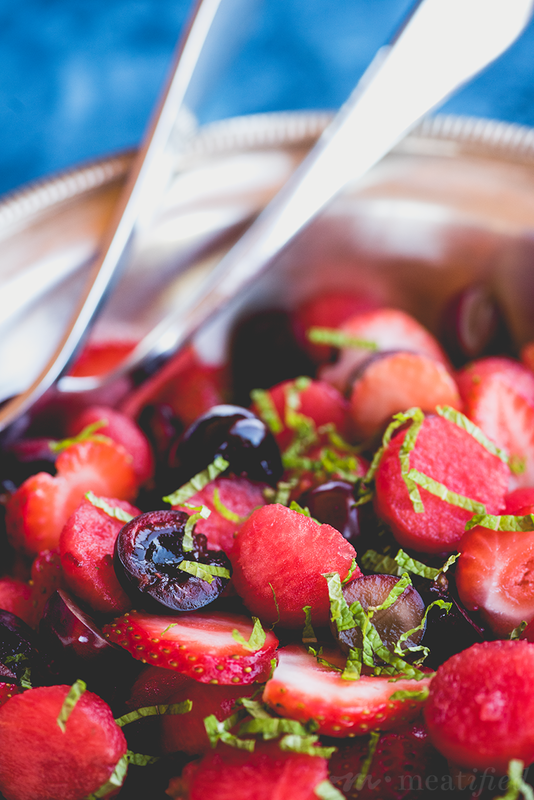 COMBINE: Add the watermelon, strawberries, grapes, cherries and lime juice to a bowl. Sprinkle the amchur, salt, ginger, pepper, mace and chopped mint over the fruit, then stir to combine. MACERATE: Let sit at room temperature for 30 minutes or so, stirring occasionally. This will allow the fruits to release some of their juices and for all the flavors to mingle before serving. MAKE AHEAD: Combine all the ingredients, except the fresh mint and stir to combine. Refrigerate up to overnight, then add the fresh mint just before serving. The longer you allow the fruit to macerate in its juices, the more deeply pink the strawberries will become and the fruit will soften slightly. The sour and spicy elements of the seasoning blend will mellow out, too, so if I make this overnight, I like to serve the summer fruit salad with an additional pinch of salt and black pepper, a sprinkle of dried mint and a drizzle of honey. Amchur, or amchoor, is a traditional souring ingredient in Indian and Pakistani cuisines. It’s made from the dried powder of sour green mangos and you can find it in international or Indian markets. Alternatively, you can find it here on Amazon! This recipe is fun, sophisticated and tastes like it took hours to prepare! I brought this to a yoga class of 8 people and it was a hit, namaste!